sat in the kitchen, sick, skinny as a sapling, beaming over tea. while we sat at the window, watching him remove the fruited branches. the house choked on its ordered contents. His need for change, our fear, that weather. in ground; as though nothing really changed. thick August afternoons our father stayed away. the end of our family still far from our minds. from the malleable ground. The river urged away. and turn the orange earth into pinch-pots and people. under faucet water, clumps of clay slowing the drain. Emily Pulfer-Terino grew up in Western Massachusetts, where she lives and teaches English at Miss Hall’s School, a boarding school for girls. 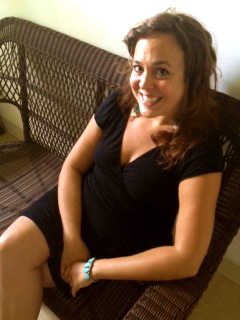 She holds a BA from Sarah Lawrence College and an MFA in Creative Writing from Syracuse University. She has received a Tennessee Williams scholarship for poetry at the Sewanee Writer’s Conference, and she was a creative non-fiction fellow at the Vermont Studio Center. Her work is published or forthcoming in Hunger Mountain, The Southeast Review, Poetry Northwest, Stone Canoe, The Louisville Review, Numéro Cinq, The Alembic, Oberon, and other journals and anthologies.